There’s nothing quite like competition day. The sound of skate guards clacking against rubber mats and concrete fills the halls as competitors young and old mill around behind the ice before the program starts. Whether you’re preparing for your first competition or your 100th, the lead-up to competition day will mostly stay the same. As you advance through your skating career, features and figures will come and go; classmates will cease to wait with you in a joint dressing room and coaches will join you as you await for your final scores. But how you handle your figure skating preparation is another matter. Getting ready for competitions starts weeks before your actual program. There are obvious steps to preparing for competition, such as practicing, but being at peak performing condition takes mental and physical preparedness. We’re going to assume that in preparing for competition you and your coach are going through your program and working on your skills, so we won’t be covering practicing in the traditional sense. We’ve covered getting in the right mindset, the best competition practices for skating, and 6 tips for a successful competition. 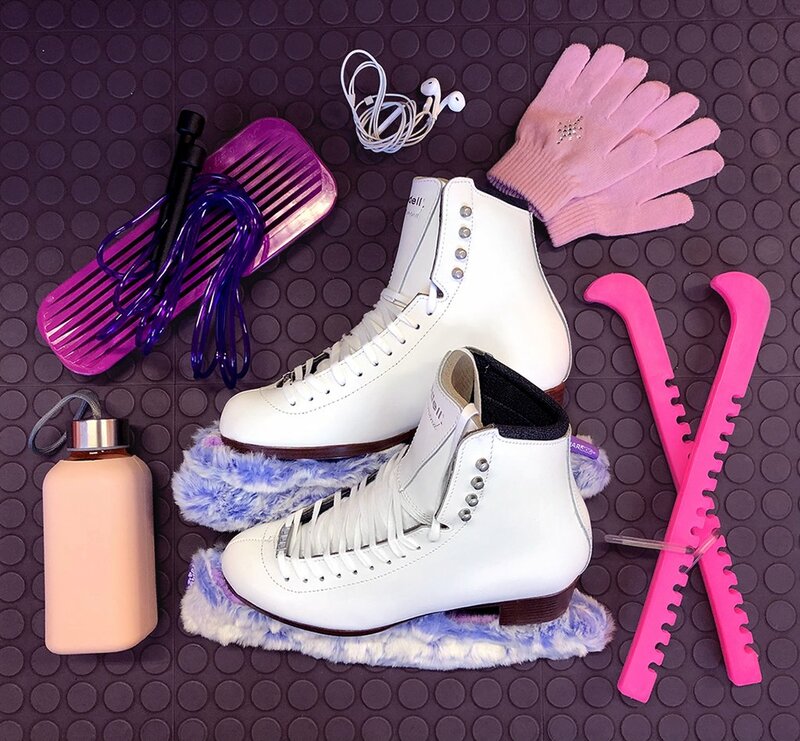 Today we’ll be passing along some tips that our coaches and skaters have passed along through the years that have helped them prepare for skating competitions. Try something new! This might seem contrary to all common sense, but hear us out. Sometimes, when you try a new relaxation technique or skill you may be surprised by the results. We know that your days are very full with training, that’s why all of these activities listed are ones that can be performed either in a group setting when your schedule allows, or by yourself for a little self-reflection time. Ballet performed for the sake of gaining flexibility and awareness of your body can be highly beneficial to your overall skating performance. We would advise against point work as your toes already get put through enough. Try implementing some bar work into your daily stretching routine, or set aside 20 minutes to learn some simple across the floor combinations. Ballet can help you increase your flexibility, musicality, and vertical. Stick with us on this one. Has your coach ever told you to “feel” the music more or to “play the pauses?” Confused as to what they’re talking about? Learning your choreography and practicing your skills is only part of the equation when it comes to giving a gold medal performance. The top figure skaters today do more than just skate, they live and breathe the music and role they’re portraying. Having the timing and musical ability that playing the piano will afford you can make a world of difference when it comes to connecting with your music and relaying that skill and emotion to the audience and judges. Try learning a few simple pieces to gain a deep understanding of music and how you can work with it. In a sport where minutes matter, every second should be accounted for. But often times we forget to take a few seconds to check in with ourselves and to be present in the moment. At competition and in practice your mind is going to be focussed on the task ahead. You’ll be visualizing yourself on the ice and running through your program constantly, but we recommend that you take a few seconds to be present. In the moment after you’ve taken your starting stance and you’re waiting for your music to start and for the lights to come up, take a moment to just be. Take a deep breath in, listen to the crowd as they shift in their seats, feel the crunch of the ice under your blades. Take a moment to appreciate where you are. Dismiss all thought of what came before and what is to come after and take in every nuance of your current situation. When you forget to perform this small task it can be easy to get swept up in the excitement and pressure of competition or practice. Grounding yourself and taking the time to notice your surrounding can make a big positive impact on your state of mind. Do you know what color the ceiling is above your rink? What color are the benches in the arena? Notice where you are so that you can be mindful of where you’ve been and where you’re going. Studies have shown us that writing something down can greatly increase memory retention, making journaling a great tools for keeping track of the notes you receive from your coach during competition and practice. Your skating journal can also be a place for making lists, recording scores, or writing down helpful information. Additionally, you can also use your skating journal to keep track of your favorite competition day rituals such as recipes, workout or stretching routines, and names of important figures who will be in attendance. Use your skating journal as a personal assistant and take it with you wherever you go. Whether you’re preparing for your first competition or your last, making some small additions to your usual routine can prove to be beneficial for both your mind and body. What do you do to prepare for your figure skating competitions? Do you have any insider tips and tricks that help you through competition season? We’d love to hear about how you keep yourself grounded while competing and traveling. Share your tips with us today!